Before I begin any lightening process, I make a game plan for addressing the canvas I am working with. I plan the timing, the volume of developer and the type of application I need to get to my desired result. Timing is super important when evening out a canvas. In this case, I was evening out about 5 different tones and levels, so I used an assistant for application so I could control my timing. 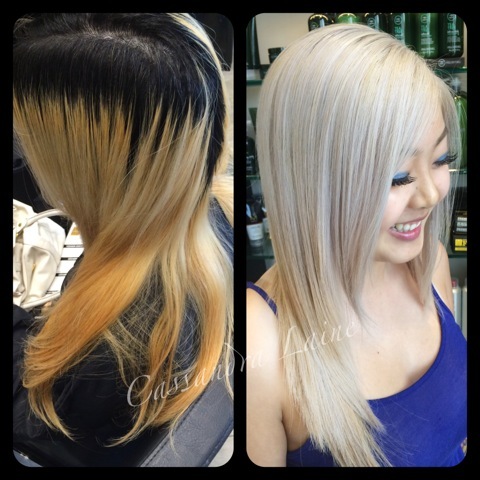 My guest’s inspiration for this look was Guy Tang’s super light, icy, pearl blondes. All of his beautiful blonde work on naturally dark hair shows that it is possible to lighten dark hair and achieve a healthy end result. My guest found me on Instagram and traveled two hours from Orlando to Tampa to see me—she was prepared to travel to California to see Guy if she couldn’t find someone in a somewhat local region!. For this look, I drew personal inspiration from a few sources. I love the light pearly blondes and pastels that are often seen in Japanese street style and the overall trend of light pastel hair. I also looked to social media because I find lots of inspiration from fellow Paul Mitchell Educators and hairdressers around the world. It’s such an amazing platform for hairdressers! My first phase was to lift the level two to about a level eight to give me a controlled and even canvas. I used Paul Mitchell Dual-Purpose Lightener, one of my go-tos for big jobs like this one. What I love about Dual-Purpose Lightener is that it has the power to lift seven full levels, but maintains the condition of the hair with castor bean oil and jojoba oil. I used it with 30 volume Cream Developer and a very gentle application, and completely avoided overlapping the 30 volume on any of the previously lightened hair. I used “baby foils” (foils torn in half or quarters) to incubate the regrowth and cold shaft with an overlay technique (also known as a Platinum Card technique) but I left the ends outside the foils. I used extremely small sections to ensure even lift and saturation. I let the hair process to the yellow/orange stage of lightening. Once her regrowth was lifted to a similar level as the ends, I began my second application. On the darker panels, I used Dual-Purpose Lightener and 20 volume in foil packets for extra incubation and lift. I let everything process until the yellow stage of lightening. I knew that my guest’s hair was able to handle the extra energy and needed a boost to get to the pale yellow stage of lift, so I removed all foils. Everything was relatively even and at the yellow stage of lightening. I applied Dual-Purpose Lightener and 30 volume directly over the Dual-Purpose Lightener that was already processing on the cold shaft, being careful to avoid applying near the scalp. 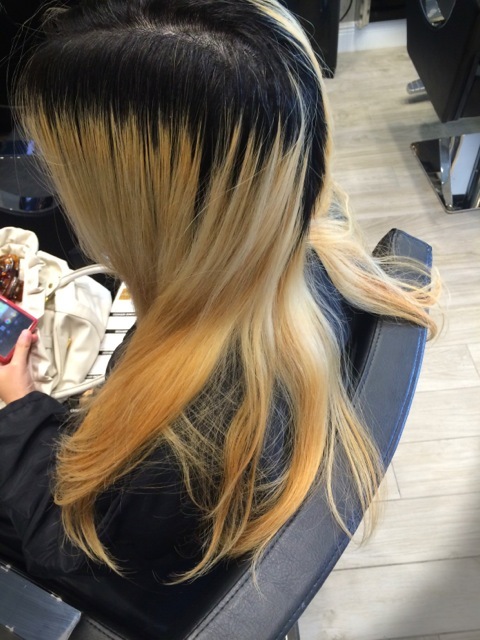 I then mixed a color balance with Dual-Purpose Lightener, 20 volume Cream Developer and Shampoo One®. I applied this from the end of the regrowth through the ends of her hair. I let this process for 10-15 minutes until her hair was at the perfect shade of pale yellow. I like to think of the energy in our developers like the gas in our cars; how much we have, determines how far we can go. The second application of lightener was like a nitrous boost. It sped up the process and reenergized the lightener to push it just past the point where most dark hair wants to stop. This must be done with a very watchful eye with two people applying the lightener. The hair’s integrity comes first. To maintain the inner strength and elasticity of her now beautiful blonde hair, I used The Super Strengthener™ after I rinsed her hair but before I shampooed. This is such an important step. The Super Strengthener returns the hair’s pH to a normal state and provides a shot of the Super Strong Complex, rich in amino acids and proteins. After shampooing, I used Paul Mitchell the color Ultra Toner Ash and 9P mixed in equal parts with 10 volume. I let this process for 5-10 minutes. This formula is perfect for a soft, smoky pearl blonde because it neutralizes unwanted tones while providing that sought-after platinum tone. To reinforce the tone and add hydration and shine, I decided to finish her toning process with PM SHINES 9V, 9A and Clear in equal parts. PM SHINES is an ideal topcoat for super light blondes because it provides beautiful translucency and UV protection. 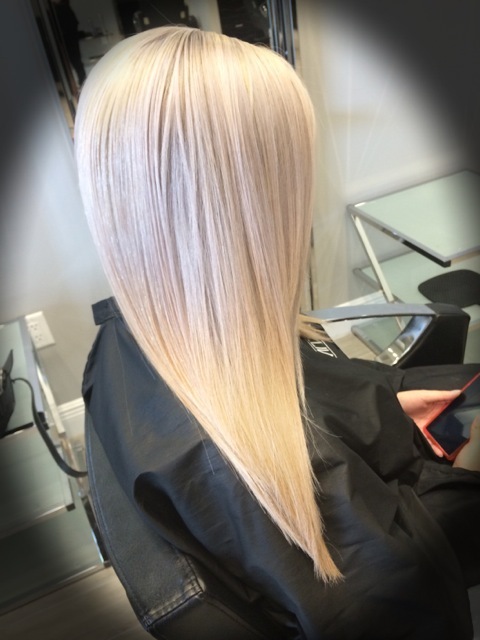 Now, for the icing on the cake, I used an Awapuhi Wild Ginger® KeraTriplex® Treatment to give her hair a long-lasting, smooth and shiny finish. This is a MUST for any guest undergoing a big jump in color, as this service transforms weak hair into pillars of strength! The super concentrated complex of keratin proteins instantly penetrates the hair to repair, rebuild and seal the cuticle. It’s a must-have for all of my blonde guests! 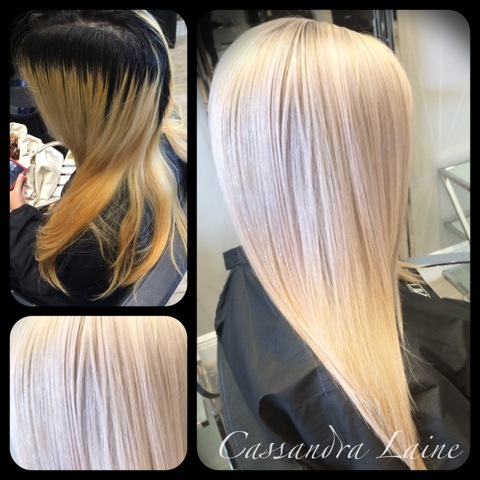 Maintenance: Four-week retouch with Dual-Purpose Lightener and 30 volume, Platinum Card with baby foils at the regrowth. Tone appropriately and follow with an Awapuhi Wild Ginger KeraTriplex Treatment. Take Home recommendation: Forever Blonde® Shampoo, Conditioner and Dramatic Repair®. As a blonde myself, I can’t live without Forever Blonde! These products are the perfect Take Home option for any of our guests undergoing a lightening service. They’re sulfate-free, intensely hydrating and designed to maintain and restore health and vitality. What salon are you located at in Tampa? I go to the Paul Mitchell School in Tampa.